Learn something else a short lesson of group dynamics, how psychologists used an optical illusion to discover something really interesting! 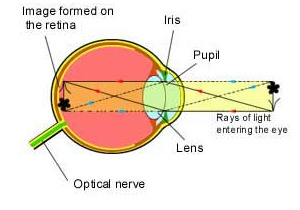 This is just a diagram of the eye, and how the eye relays the images to the brain to form pictures. This is one of the few pictures on cool optical illusions that is NOT an optical illusion. Notice that the picture of the flower actually gets formed on the retina upside down! Your brain actually flips the image right side up. Scientists actually did a study on some people by giving them mirrored glasses, which they were required to wear constantly for days. These glasses had the effect of making everything they saw turn upside down. Although very awkward at first, after a week or so their brains actually started flipping the images right side up, and it was just like before! Then when they took off their special glasses, everything was upside down for a while as their brain adjusted! Did you know that if you project a spot of white light on a wall in a dark room, and look at it for a few minutes, it will appear to move? Even though it does not actually move? Psychologists used this in a famous experiment where they would take a group of people and show them the spot of light. Then they would ask how far the light moved. The interesting thing is that the psychologists actually had only one real participant in the group, and the rest were working for the psychologist. In group A, The "workers" would all report a much larger distance than they had actually seen: for example 14 inches. Then Participant A would answer. In group B, they would have the participant verbally give the answer first, so as not to be swayed by the group. As you might expect, the participants in group A reported a much larger movement than those in group B, even though they had seen the same thing! Furthermore, the participants in group A didn't only report a larger number to sound better to the group, they truly BELIEVED that they saw the line move much farther. So just remember, if you are trying to persuade someone to believe something, a technique you can use is to have others who share your opinion talk about it first, so that the person sees that they are in the minority. They just might start to remember things differently.